Web Japan > NIPPONIA No.33 > Bon Appetit! 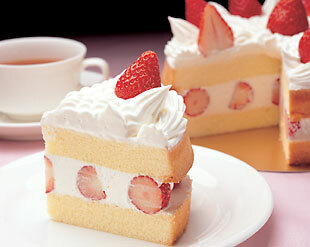 This "short cake" made by Fujiya Co., Ltd., catches the eye with its white whipped cream and red strawberries. Short cake is often served in the home on festive occasions. The whole cake (right background) measures 18.5 cm in diameter. A light and airy sponge cake, whipped cream, bright red strawberries on top  this is "short cake," a favorite treat in Japan. The fluffy whipped cream, so rich and sweet, melts in the mouth. The strawberries, a Japanese variety with just the right firmness and tartness, are a treat in themselves. And the sponge cake, velvety soft, brings everything together. It would be hard to find a Japanese person who has never eaten this variety of short cake. The "short"of "short cake" appears to have come from the English "shortening," a common ingredient in Western-style confectionaries. The Japanese recipe goes back to the early 20th century: in 1912, Fujii Rin'emon went to the United States and mastered the art of making Western-style sweet food. One dessert that caught his interest was a butter sponge cake with sweetened fruit and whipped cream. After he returned to Japan in 1922 he developed his own variety, using strawberries, whipped cream and sponge cake. This was the ancestor of today's short cake. Incidentally, Fujii was the founder of Fujiya Co., Ltd., one of Japan's early manufacturers of Western-style confectionaries. By around 1952, not long after World War II, the cake had basically come into its own, with more or less the same taste and shape that we see today. Only a few stores sold it in those days because refrigerated display cases were rare. The cake first appeared in TV commercials in 1958, and that whetted the taste buds of people throughout Japan. Sales took off after refrigerated display cases became common in the 1960s. Up until then, the most popular cake was the easy-to-keep-fresh decorated variety containing creamed butter. But by the middle of the 1970s the short cake had moved ahead, and it and its spin-offs have led the pack ever since. Of course, it did not take long for other Western-style confectionary makers to enter the short cake market created by Fujiya. In Japan today, sweet foods look and taste about the same as those in the West, and they are much in demand. But the short cake, that unique blend of Western and Japanese sweet tastes, still holds its own. If you visit Japan around Christmas, you will see it sold almost everywhere. And if you say "cake," most Japanese will think first of this sponge cake with whipped cream and strawberries, and they will feel like having some, too! Five-story Pagodas: Why Can't Earthquakes Knock Them Down?